Info Arthur Thomas Stewart (January 11, 1892–October 10, 1972), more commonly known as Tom Stewart, was a Democratic United States Senator from Tennessee from 1939 to 1949. Stewart was born in Dunlap, Tennessee. He attended the former Pryor Institute, a private school, in Jasper, Tennessee and Emory College (now Emory University) in Atlanta, Georgia. He returned to Tennessee and attended law school at Cumberland University in Lebanon. Upon admission to the bar in 1913, he set up practice in Birmingham, Alabama. He moved back to Jasper, Tennessee in 1915 and practised there until 1919, then moved to Winchester, Tennessee. In private practice in Winchester, he was elected district attorney for the former 18th Circuit for a term beginning in 1923. He served in this position until 1939. 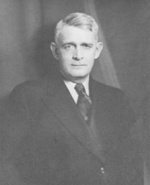 In 1925 Stewart was the chief prosecutor in the Scopes Trial. Stewart designed the prosecution's argument to preserve political control over the schools exclusively within the state legislature, thereby keeping the trial to the narrow, legal matter and forestalling attempts by the defense to introduce scientific testimony to show there was not a conflict between evolution and the story of divine creation set forth in Genesis. Except for the willingness of William Jennings Bryan to be cross-examined by Clarence Darrow, Stewart's positions controlled the trial and the Scopes defense had no recourse but to ask the jury to convict the defendant so the case could be appealed to the Tennessee Supreme Court (which overturned the conviction on a legal technicality but upheld the constitutionality of the Butler Act). In 1938 he entered the race for the balance of the unexpired term of the late Senator Nathan L. Bachman, who had died in office. In the August Democratic primary he defeated labor union leader George L. Berry, who had been appointed to the seat upon Bachman's death by Governor Gordon Browning, and was elected Senator on November 8. Eligible to begin serving immediately, he instead waited until the expiry of his term as district attorney on January 16, 1939 to take his Senate seat. Stewart was somewhat typical of the Democratic Party's Southern wing of that era. He has been considered by some to be at least somewhat an ally of Memphis political boss E. H. Crump, but less so than Tennessee's other Senator of the time, Memphian Kenneth McKellar. Stewart was reelected in 1942, but in 1948 was challenged for renomination by Estes Kefauver, a progressive East Tennessean who defeated him. Stewart returned to the private practice of law. He died in Nashville and was interred at Winchester's Memorial Park Cemetery.